David Schmidtknecht, Principal Data experts on social media had a good laugh when ‘Big Data Borat’, the voice behind a parody account tweeted that data science is 99 percent data preparation and 1 percent misinterpretation. Business Intelligence (BI) tools today are indispensable in bringing data-driven possibilities to life, while organizations are still investing substantial time in normalizing and collecting data. While working as an accountant for notable federal and commercial organizations, David Schmidtknecht, Principal, cBEYONData® witnessed instances where CFOs struggled to access data out of financial systems. To put an end to this predicament, Schmidtknecht and his team introduced the world to cBEYONData®, a results-driven firm that provides exceptional BI and analytical services. “The real focus for us is to empower users through self-service BI tools that allow them to explore whatever data they want, whenever they want while spending less time on data management and more time on strategic analysis,” says Schmidtknecht. With a leadership team that brings over a hundred years of combined experience in BI, cBEYONData® is purpose-built to addresses the full continuum of a customer’s analytical, compliance, and reporting requirements by utilizing an agile methodology and automated business processes that reduce development cycles and the amount of manual work needed in data aggregation and cleansing. “We specialize in supporting the highly sensitive information assets of federal agencies and commercial firms, and our ever-growing list of new customers, retention rates, references, and awards speak for itself,” adds Schmidtknecht. "The real focus for us is to empower users through self-service BI tools that allow them to explore whatever data they want, whenever they want"
cBEYONData® has developed multiple rapid deployable BI, data management, and analytic solutions. As these solutions matured, the company combined several of the most federal CFO relevant solutions to create the CFO Control Tower®. The CFO Control Tower® is a scalable toolkit that enhances financial and performance management affordably and can be deployed either on-premise or utilized through the cloud. The solution is a combination of over 100 pre-built BI components such as budget and procurement reports, analytics, dashboards, data models, and data extraction tools that ensure CFOs have access to on-demand financial analytics and reports. “Since our solution is off the shelf, 80 percent of the work is already done for our customers. As opposed to other vendors who take years to build a financial data mart, we are ready to go-live in three months along with any personalization requirements requested by the client,” mentions Schmidtknecht. The CFO Control Tower® easily integrates with a client’s existing systems, it extracts and consolidates data from internal and public source systems as well as disparate financial systems, and produces reports, alerts, and meaningful analytics, all delivered through a single integrated portal. In addition, the solution also provides regulatory, systems assurance, and security monitoring services for secure, compliant reports. “The federal CFO’s mission is becoming more and more challenging with Treasury and the Office of Management and Budget (OMB) initiatives such as the DATA Act and Technology Business Management (TBM). We have a deep understanding of these requirements and how they relate to our customers data lineage and quality. Through our years of experience in assisting federal organizations with standardization and normalization of data and taxonomies, we have enabled our customers to quickly and effectively meet these compliance standards,” remarks Schmidtknecht. 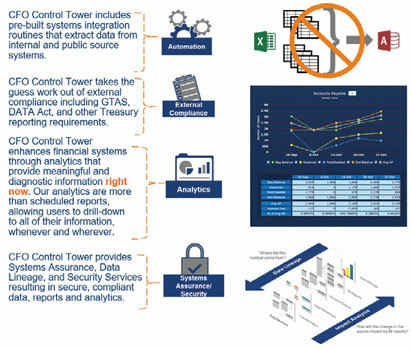 The CFO Control Tower® also helps agencies with their annual audits. In conjunction with pulling data from accounting systems, metadata layers are used to bring together a single view of budget and spending data to record outcomes from multiple disparate financial databases. In one example that demonstrates the power of the solution, a cBEYONData® client was facing challenges in effectively harnessing their data sets for auditing. The CFO Control Tower® automated the inefficient process and provided a single data source for all to use creating a single “version of the truth.” This enabled the client to achieve a clean audit within two years of implementing their new financial and financial reporting systems. “At the end of the day, a tool is just a component. The key to success is to uniquely manage data in real time and deliver an easy-to-use solution that is extremely powerful,” explains Schmidtknecht. To deliver these state-of-the-art solutions, cBEYONData® has forged formal partnerships and strategic alliances with several market leaders such as SAP, Microsoft, Amazon Web Services, Information Builders, ESRI, GB&Smith, VisualCue and other leading software and data companies. While data is ruling the world today, cBEYONData® aims to rule data. The company focuses on hiring data experts who are passionate about harmonizing data that can help customers unleash deep insights. “Our workforce comprises highly skilled and motivated individuals who are mid-to-senior level experts that possess an average of over 15 years of financial and technical knowledge. We focus on specific service offerings which enables the company the flexibility to offer high-end data management services at a competitive price,” says Schmidtknecht. cBEYONData® looks at bridging people, process, and technology to deliver the best in-class solutions for our clients. For maximum client benefit, cBEYONData® offers on-site training and knowledge transfer that is based on the customer’s software environment and data ecosystem. To bring down the learning curve, the company tailors all training based on organizations’ actual reports, dashboards, business processes, and procedures. In order to better support customers, the company has recently deployed a comprehensive Business Process Management module that improves and automates existing business processes as well as provides a framework for further automation. What sets cBEYONData® apart from other market players is its unique value proposition and culture. “Business is like playing golf,” remarks Schmidtknecht. If you want to score well, you must be steady, consistent, and focused. Take calculated risks (shots) when you can but don’t deviate too far from your plan. “Keeping your composure at all times (when you hit a great shot or poor one) is a must to ensure you stay on track,” he adds. To ensure sure-shot success in all their endeavors, cBEYONData® has set up a customer support lab which is used to test out new tools in addition to pre-testing software patches and new releases to ensure customer success and reduce upgrade challenges. The company always keeps an eye out for new BI tools and currently they are implementing an advanced visualization tool, and a predictive analytics tool into their solution. For a holistic solution delivery, cBEYONData® has also established a BI Center of Excellence (COE) that merges the strategic role and governance of program management with business expertise. The BI COE allows organizations to leverage best practices and standards, conduct application administration, and provide enterprise-wide management of technical and functional resources for increased success rates of enterprise business intelligence deployments. In the coming year, cBEYONData® will focus on advancing new cloud technologies and driving new capability to the CFO Control Tower®. Plans include a new component to track and report federal spending in support of the OMB TBM mandate for federal organization. “Our mission is to allow customers to focus on the needle and not on the haystack. In other words, while our tools captures, organizes, and analyzes information from multiple data sources, our customers can focus on the power of good data and forceful analytical insights,” ends Schmidtknecht.